The habanero (/ˌ(h)ɑːbəˈnɛəroʊ/; Spanish: [aβaˈneɾo] ( listen)) is a hot variety of chili pepper. Unripe habaneros are green, and they color as they mature. The most common color variants are orange and red, but the fruit may also be white, brown, yellow, green, or purple. Typically, a ripe habanero is 2–6 cm (0.8–2.4 in) long. Habanero chilis are very hot, rated 100,000–350,000 on the Scoville scale. The habanero's heat, flavor and floral aroma make it a popular ingredient in hot sauces and other spicy foods. ^ "Chili – Evergreen Orgnaics". EvergreenOrganicsBelize.com. Retrieved 2016-12-01. ^ "Chile Pepper Heat Scoville Scale". Homecooking.about.com. Retrieved 2013-04-14. ^ "Habanero". Merriam-Webster. Retrieved 2013-10-26. ^ "El chile habanero de Yucatán. Origen y dispersión prehispánica del chile habanero". Ciencia y Desarrollo. May 2006. Archived from the original on February 12, 2012. Retrieved 2015-01-07. ^ Bosland, P.W. (1996). J. Janick, ed. "Capsicums: Innovative Uses of an Ancient Crop". Progress in New Crops. Arlington, Virginia: ASHS Press: 479–487. Retrieved 2013-04-14. ^ Bosland, P.W. "The History of the Chile Pepper". Brooklyn Botanic Garden. Archived from the original on May 24, 2014. Retrieved 2014-12-12. ^ Eshbaugh, W.H. 1993. “History and Exploitation of a Serendipitous New Crop Discovery”. pp. 132–139. In: J. Janick and J.E. Simon (eds. ), New Crops. New York: Wiley. As reproduced at "Uncle Steve's Hot Stuff". ^ "Profile of the Habanero Pepper". Whole Chile Pepper Magazine. July 1989. Archived from the original on 2012-09-06. Retrieved 2013-04-14. 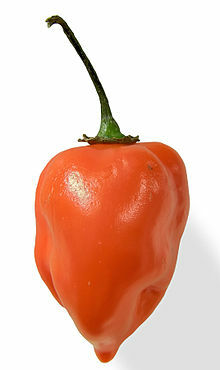 ^ a b "Habanero". WorldCrops.org. Retrieved 24 March 2017. ^ a b Ruiz-Lau, Nancy; Medina-Lara, Fátima; Minero-García, Yereni; Zamudio-Moreno, Enid; Guzmán-Antonio, Adolfo; Echevarría-Machado, Ileana; Martínez-Estévez, Manuel (1 March 2011). "Water Deficit Affects the Accumulation of Capsaicinoids in Fruits of Capsicum chinense Jacq". HortScience. pp. 487–492. Retrieved 17 August 2017. ^ Santa Ana III, Rod. "Texas Plant Breeder Develops Mild Habanero Pepper". AgNews, 12 August 2004. ^ Page-Mann, Petra (6 April 2015). "Habanada: The Unmasked Habanero". Cornell Small Farms Program. Retrieved 9 March 2018. ^ Danovich, Tove (12 Feb 2017). "This Heatless Habanero Packs All Of The Flavor With None Of The Burn". NPR.org. NPR. Retrieved 9 March 2018. ^ "Black Habanero". Archived from the original on 2013-10-29. ^ "Caribbean Red Habanero: Tropical Thunder". PepperScale. 6 May 2016. Retrieved 2 July 2017. Wikimedia Commons has media related to Capsicum chinense and Habanero.